Difference between revisions of "Red Bacteria"
Every 1.5 to 3 minutes there is a chance that a Red Bacteria will spawn on the screen. Tapping on it does not break the idle BPS streak and gives a random reward. The player may receive it immediately or watch a short second video ad to increase the reward amount. The latter option requires an active internet connection. By researching Alien Life Forms in the Dark Matter Institute, the player can reduce the Red Bacteria spawning time by 20%. Regardless of the reward offered by the Red Bacteria, it is possible to increase it by watching a short video ad. After the watching the ad, there is a cooldown of approximately 1 hour, where Red Bacteria ads are not available and it's possible to select only the free reward. The cooldown for Red Bacteria ads is in no way related to cooldown for other ad types. If you have an active subscription, then you can receive the better reward without watching ads. * - If you do not have any research in progress, then no Red Bacteria will spawn with a reduced research time reward. Purchasing a Time Machine does not remove the active Red Bacteria effect. However, the increased BPS reward does not influence how many Bacteria will be gained from the Time Machine. Attacking a planet does not remove the active Red Bacteria effect. 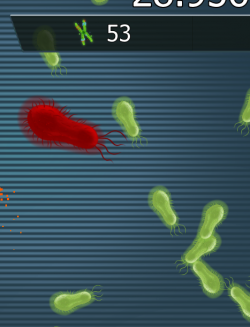 If the player receives a reduced research time reward from the Red Bacteria, the current travel time for Scientists is reduced as well. Entering a Black Hole does not remove the active Red Bacteria effect.